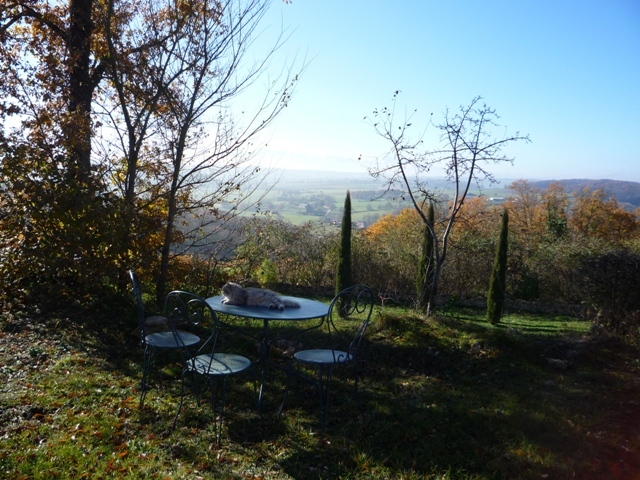 How lovely to be back in France after three days in London at the France Show in Earl’s Court; to walk the dog in the fields behind the house this morning, breathe some fresh mountain air and drink my coffee on the terrace in the sun. And it seems that I am not alone in preferring this life; many people I spoke to at the France Show were looking for a similar change of lifestyle. Noticeable this year were the number of serious buyers ready to make their long-planned move to France, who have done their research, know where they want to be and have sensible and realistic expectations of what they can afford and will get for their money. Winter sunshine and a cat’s life! It was also interesting at the show to see how many more people now understand both what a property finder does and the benefits of using one. Our services are well understood in places like America, Canada, the Middle East and Australia but it is only recently that professional buying agents have entered the collective British consciousness; mainly it has to be said, as a result of Kirstie and Phil. Clearly we save our clients money that they would otherwise have to spend on house hunting trips to France with flights, car hire, petrol and accommodation but also by knowing average prices in different areas of the region and ensuring our clients buy for the best possible price. Equally important however, is that our clients get to choose from a much wider choice of houses because we source properties from all the agents in the region as well as notaires and private sellers. Moreover, we save our clients a great deal of time and frustration by doing all the time-consuming initial trawling thorough property details and then by visiting all possibilities and eliminating the time-wasters, before drawing up a short list of houses meeting the buyer’s exact requirements, complete with photographs and descriptions. We have no vested interest in selling so they can be sure of unbiased advice; we are working just for the client and our only aim is to ensure that they find exactly the property they want at the best possible price and to make sure that they avoid any pitfalls. This is one of the most important purchases we make so professional help makes sense both financially and in terms of finding the very best properties available. Now that more and more people understand these benefits, it looks as if we all have a busy time ahead.